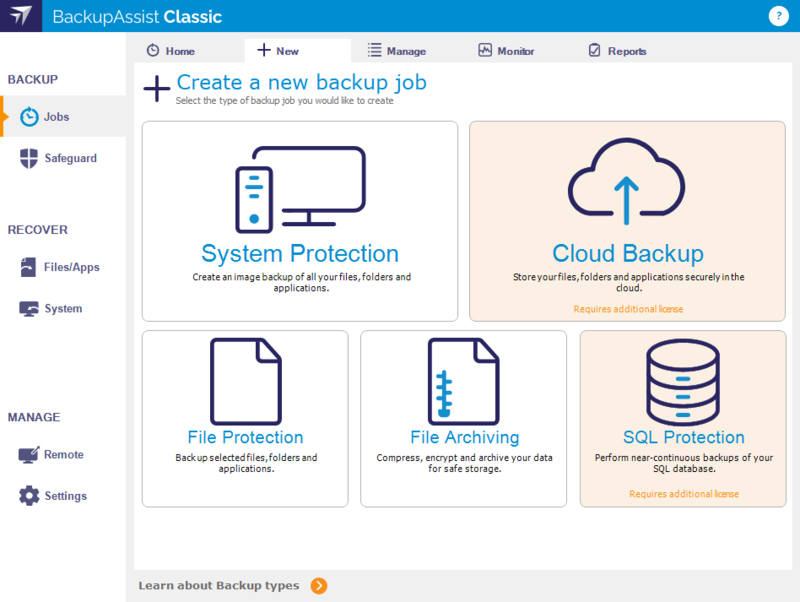 The Backup tab is used to create, manage and monitor backups and backup jobs. The options available are accessed from the Backup tab's Home page. The following functions can be accessed from the Backup tab's home page. This selection is used to create backup jobs. Below is an overview of the backup types available and what they can be used for. 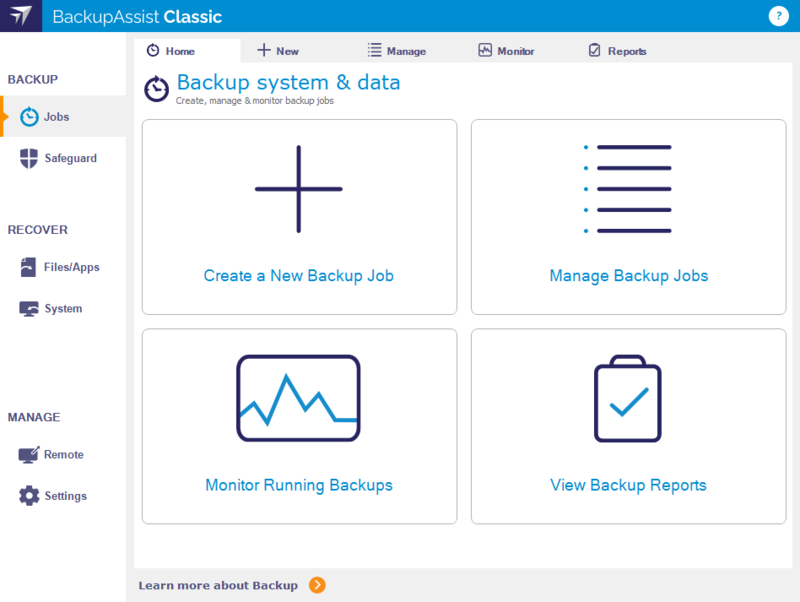 BackupAssist provides a suite of backup types that support VSS, encryption, and incremental backups. The type of backup job that is best for you will depend on what you’re backing up, your backup destination, and your restore and recovery requirements. This section provides an easy to use backup selection guide. Required for Only System Protection can create a backup that can be used for a bare-metal recovery. For this reason it should be a part of your backup strategy. System Protection creates an image backup of the files and settings required to restore a server application, as well as selected files. It uses block level imaging and is better at handling large files. Required for Cloud Backup allows you to use a cloud service provider ( ideal for businesses looking to save on storage costs) or a private cloud destination. The destinations supported are Microsoft Azure, Amazon S3 and cloud providers and private cloud destinations that support WebDAV. Required for File Protection is a simple backup option for backing up data to a local drive, removable drive or network destination, including NAS and iSCSI. Required for File Archiving zips up your data into a single, backup file. This saves disk space for data that gains from compression. It is also the only backup type that can back up to a standalone tape drive. Required for SQL Protection can back up database changes throughout the day (at 5 minute or greater intervals). These backups can be used to restore individual databases to a specific point-in-time, or an entire SQL server (including the Master Database). 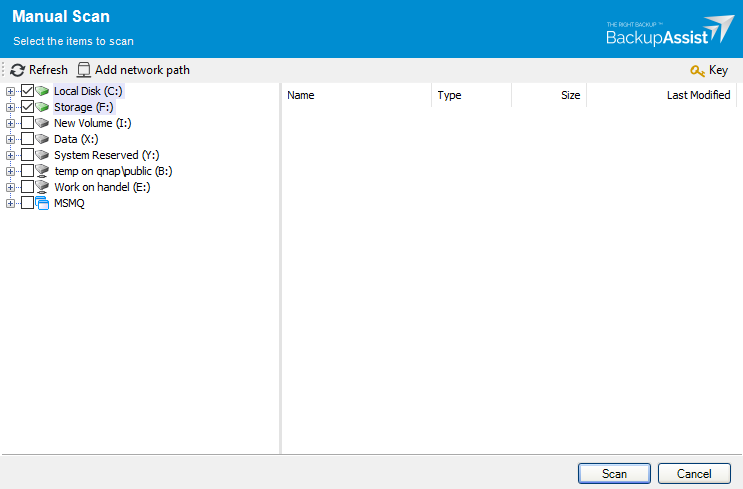 This option allows you to manually scan a system for potential ransomware, and to whitelist any files that give a false positive response, without running a backup job.